American author of Uncle Tom’s Cabin. 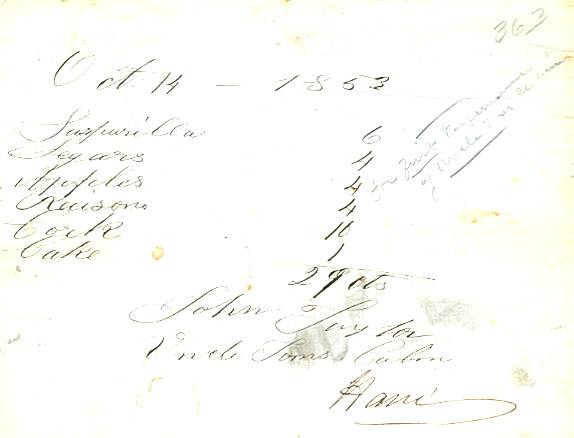 An expense account for a dramatic performance of Uncle Tom’s Cabin, one page, small oblong quarto, October 14, 1853. 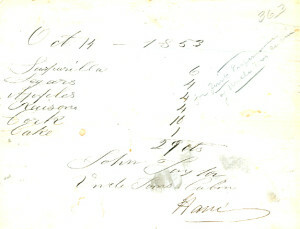 The account, totaling 29 cents, is for sarsaparilla, cigars, apples, raisins, cork and cake for John Taylor. Normal ageing; otherwise fine condition. Uncle Tom’s Cabin; or Life Among the Lowly was first published serially in the National Era, an anti-slavery paper based in Washington D.C. Despite Harriet Beecher Stowe’s name becoming anathema in the South, the book was received with such unparalleled popularity that at least 23 translations were done. It was also adapted for the stage and played to capacity audiences. In the summer of 1852, two dramatic adaptations were made in Boston and New York, reaping fantastic profits [Johanna Johnston, Runaway to Heaven].